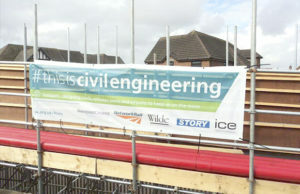 We’re proudly displaying our ICE #thisiscivilengineering banner onsite at our Plymouth Road Bridge works, Blackpool. This is Civil Engineering campaign showcases civil engineering projects by displaying huge banners at project sites across the country. The banners help increase public perception of civil engineering projects and how the project will benefit the community. The deck of the existing bridge needs replacing due to corrosion, caused by exposure to the salty seaside air. The new bridge will also be raised, in line with the electrification works taking place on the train line. 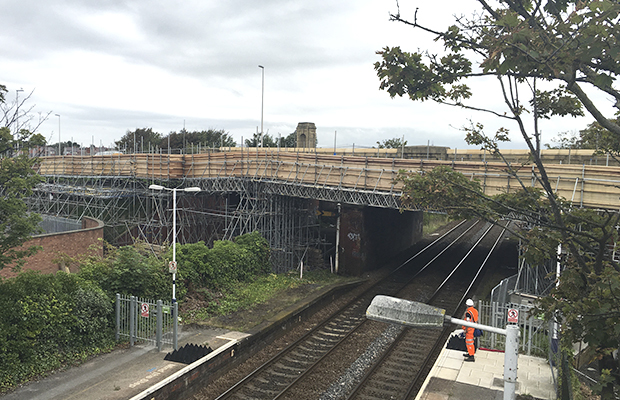 The first phase of work will create a temporary pedestrian crossing over the railway line, which will also house the service connections currently located underneath the bridge. This work is taking place in preparation for phase two, which will see the bridge demolished and replaced, after the winter illuminations season. Story Contracting and Wilde Consulting Engineers are completing the work on behalf of Blackpool Council and Network Rail. Work is expected to be completed by summer 2017.